Are you looking to generate more qualified sales leads? Generating leads is a marketer's single most important objective. Yet, only 1 in 10 marketers say their lead generation efforts are highly efficient and effective. 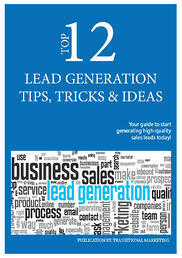 We've put together the top 12 lead generation tips, tricks and ideas, so you can start reeling in those leads. Copyright 2014.Transitional Marketing - All rights reserved.